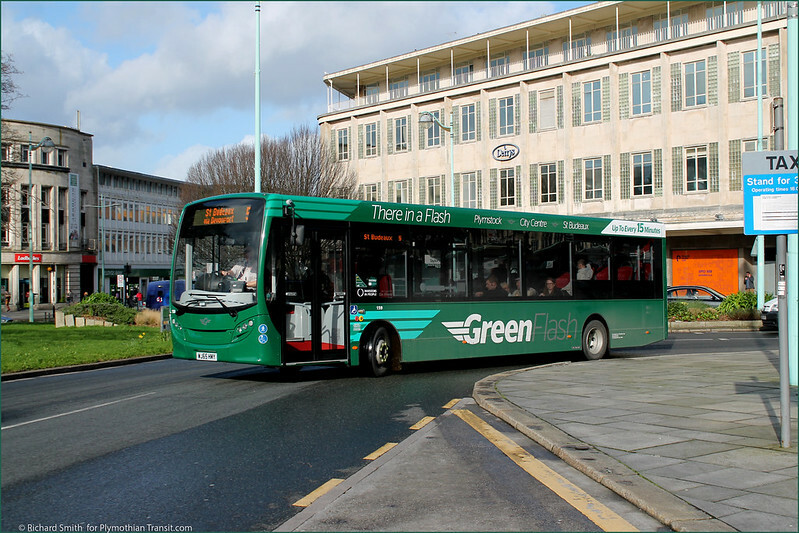 There has been a report that at least one of the Enviro 400s in green has arrived at Milehouse. The last I heard was that they were due in February, although they may wait till 1st March and enter service as 16 Registrations - although this has not been confirmed. Is it me or are the vinyls a little crooked on these? 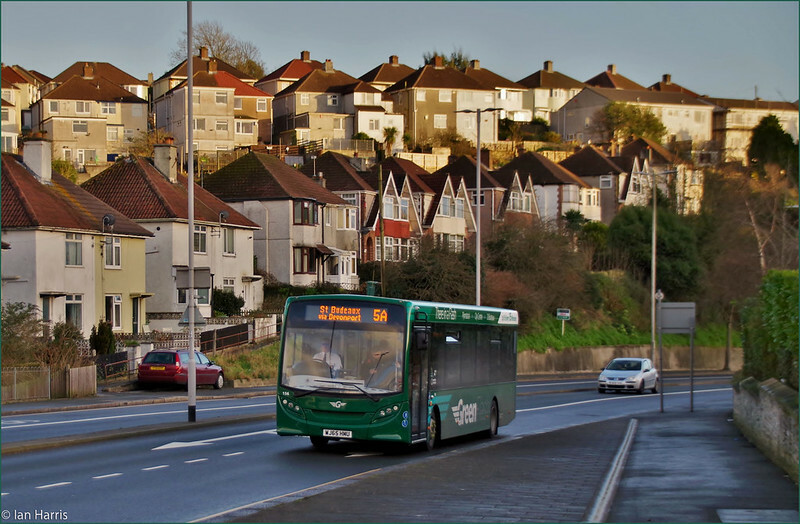 they are to assist the red flash route between st budeaux and city centre. i have driven them recently, and on no account has anyone been left behind. they are there to help out the red flash not replace it. they are more than enough for the job. Two new red Enviro 400s at Milehouse are WJ65BYY & WJ65BZA. I lived in Hertfordshire in the 80s and the Green Flash livery keeps reminding me of London Country North West post deregulation livery! Have the new vehicles directly replaced the T***EFJ and X***CDV Darts that have been withdrawn recently? 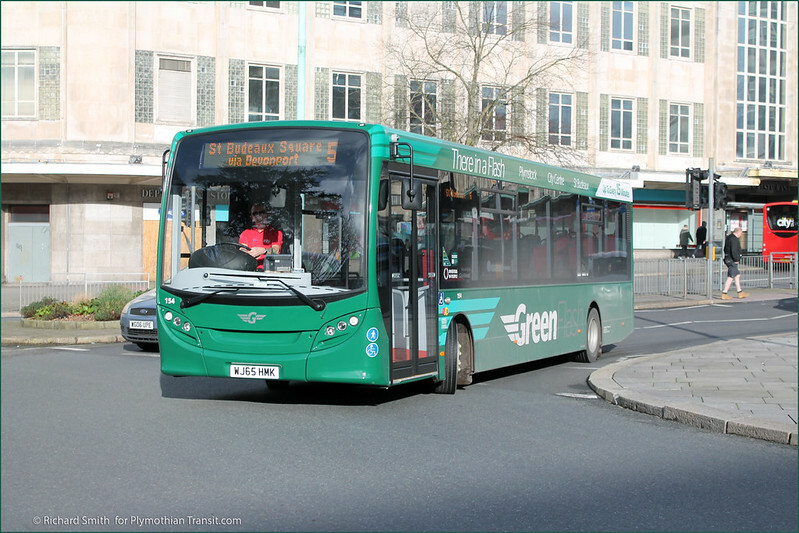 Regardless of some of the previous comments, it is good to see multi million pound investment by Citybus and Stagecoach in new vehicles for Plymouth. Bus 41 is out the front of the depot, where the vehicles require work are parked, it shows 34B on the board, so as it is not out the back, is it more likely this one is just VOR for works? Is 33 withdrawn or is it being re-engined, as it was started being so? Are any others being sent to Hants and Dorset to be made DDA compliant like 29? 485 is off the road the moment with bits missing (along with 481, 41 and 419, parked out the front). Why are T's withdrawn ahead of R's? When buses are 15+ years old, age isn't really as relevant as their condition. Perhaps the R-reg buses are in better condition, perhaps they've had more refurbishment work undertaken over the years, perhaps they are a preferred spec if there are differences between the two batches. A couple of years between buses that age really makes no odds, it's probably as simple as Citybus believing that the R-reg buses will be cheaper and/or easier to keep running or even that the T-regs will fetch a little more on the second-hand market. Does it really matter?! Green Enviro 400 at Milehouse this evening(4th Feb) but can't remember reg. 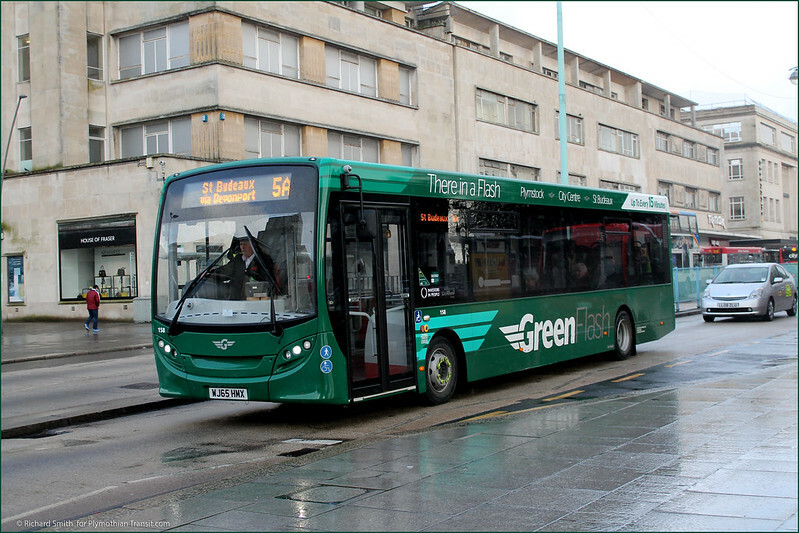 Green Enviro 400s WJ65BZD & WJ65BZE at Milehouse today (Friday 5th). 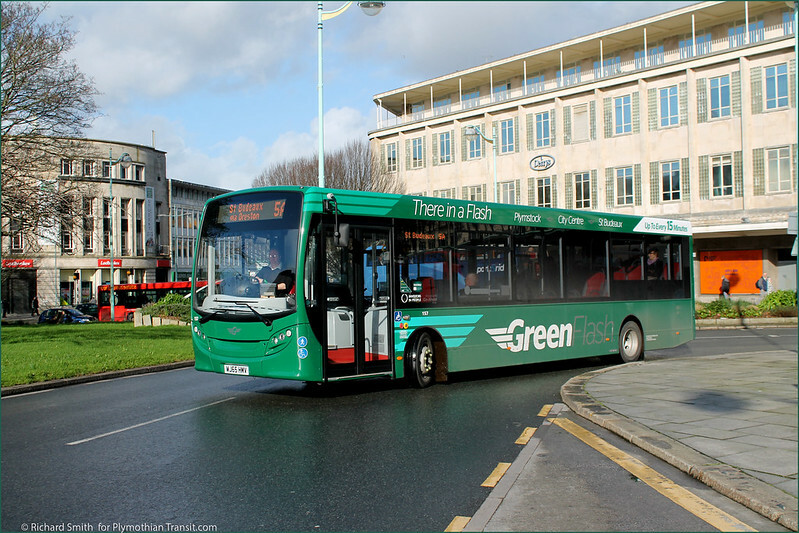 Although these new buses look smart in their green livery reminiscent of the days of Western Nationals green buses in Plymstock I think Anon 3 Feb at 21:20 has an interesting point on capacity. 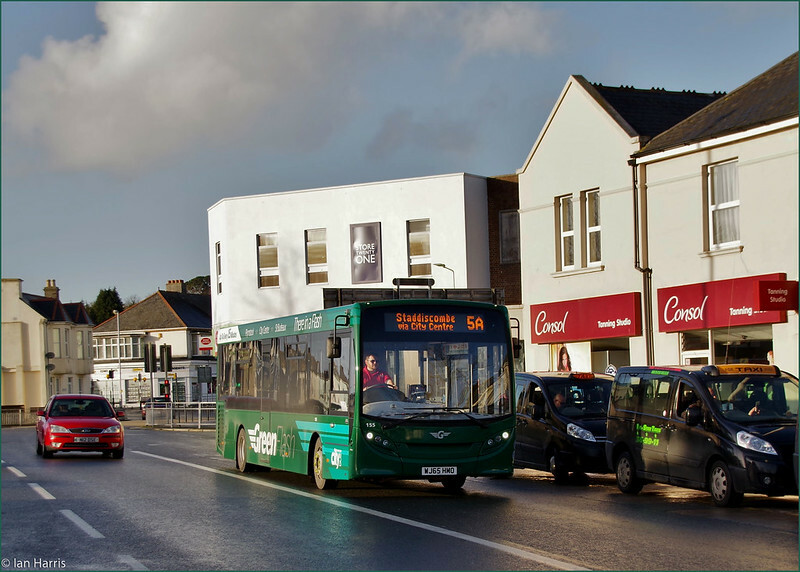 Looking at the timetable the 5/5A is every 15 minutes during the daytime and as many users in Oreston, Billacombe, Goosewell and Elburton will only be using either the 5 or 5A that's only one bus every 30 minutes. Given that this route used to be up to every 10 minutes combined, 20 minutes separate with similar sized vehicles won't this present capacity issues at times? Or have loadings dropped over the years on these routes? These are predominately more affluent car owning areas of the city and I'm sure PCB will have analysed the numbers carefully to have assessed what they need to provide here. First also had after all had effectively withdrawn from most of these areas to target areas like Honicknowle and Efford a few years ago. I have been informed that the Darts in the lower yard at Milehouse are not withdrawn but stored awaiting work to make them fully dda compliant. 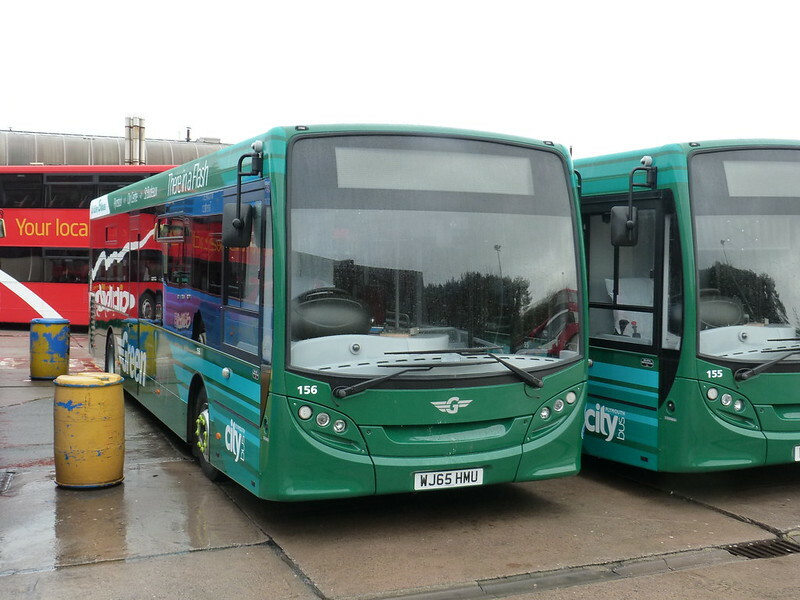 Volvo B7 416 has indeed been resurrected and has joined the CityBus training fleet. It is believed that 2 more Wright bodied B7s will also be converted to this role. Strange isn't it,in the old western national days & PJS,routes 5,6 and 7 always had excellent patronage to the extent that sometimes the old flf's & vrt's were standing room only. 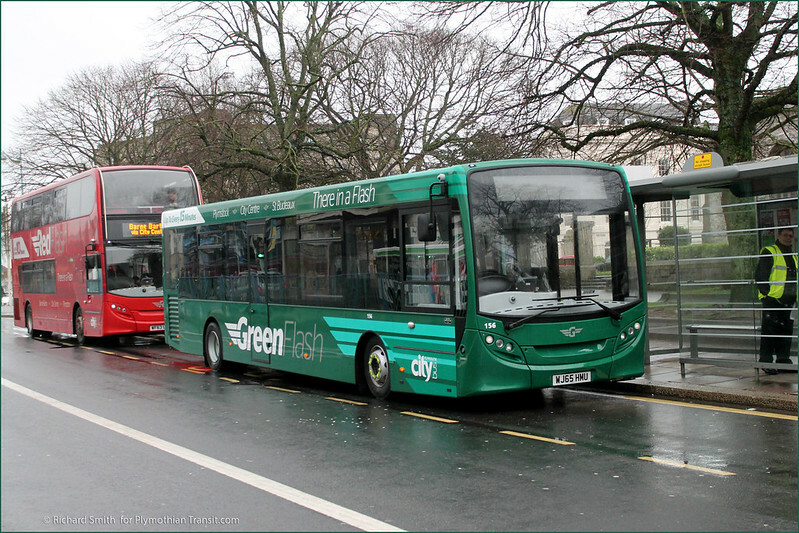 At least 2 of the new red Enviro 400s outshopped in swooped livery with 'kewgh Kernow kyttrin' (Go Cornwall Bus) fleetnames on the rear and one side. Are these for Torpoint services or is it the plan to have double-deckers on other routes into Cornwall? The T reg SPD's are waiting for work to ge completed on the to make them DDA compliant. Anon 4 Feb 0015 - the colour reminds me more of London Country immediately before NBC livery, especially the Flying Polo lookalike logo on the front.